Most employers are aware that employee turnover is part of running a company, but many are still taken by surprise when a quality employee voluntarily leaves the company to work elsewhere. Voluntary employee turnover rates don’t appear to be decreasing any time soon, and for employers that can be very costly. New research has uncovered even more troubling data regarding turnover rates. While it’s always been a priority for employers to try and minimize voluntary employee turnover, it’s even more crucial in the current job market. Unemployment is steadily at the lowest rate its been in 17 years while job switching is at a record high. An estimated 3 million Americans quit their jobs each month. 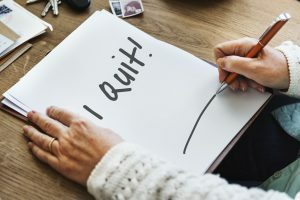 Data from the US Bureau of Labor Statistics shows that over 3 million U.S. workers have voluntarily quit their jobs every month since June 2017. This data does not account for other types of involuntary turnover. Turnover rates can vary widely by industry. According to 2016 data regarding both voluntary and involuntary turnover combined, the hospitality industry has the highest average turnover, followed by healthcare, and then banking and finance. The lowest average turnover rate is in utilities, and the second lowest is insurance. For most other industries, the rate stays close to the average total national turnover rate. Turnover happens seasonally. September has the highest average rate of total turnover (both voluntary and involuntary) while March has the lowest. A few exceptions should be noted, however, such as education-related turnover which of course peaks in July, and manufacturing turnover which has the lowest turnover rate in January. A wide variety of factors contribute to voluntary turnover. While the majority of turnover is voluntary, more than 40 factors contribute to voluntary turnover. Those individual factors can be narrowed down into six main categories: pay; promotion; overtime and premium time; commuting and transportation; experience and tenure; and other miscellaneous job characteristics. Depending on the industry, some factors carry more weight than others, though pay and promotion are typically the most influential. Some employers are not aware of the factors causing employees to leave, because they may not mention it in exit interviews in order to leave amicably. However, that does not mean they aren’t sharing information with remaining employees that can influence their view of the company. It’s important for employers to gain as much data as possible from employee turnover and work alongside their HR outsourcing representative in order to help them find strategies to retain quality employees for longer.